Girls can be sports fanatics too! 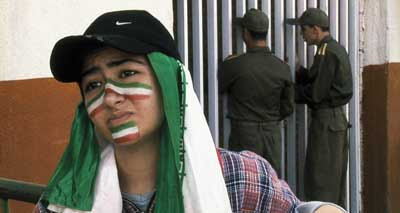 But it's not so easy for teenage girls to visit soccer games in Iran, it's actually forbidden. And soccer outside of the USA is big stuff. Could you imagine someone telling you that you couldn't go to the Superbowl if you already had tickets? That's what it's like for the girls in Offside. They have to dress up like boys and risk getting arrested in order to see a game that they love. For a film that deals with such a heavy social justice issue it has some pleasant moments that make you smile. Starring: Sima Mobarak-Shahi and Ayda Sadeqi. For Fans of...Osama and Bend It Like Beckham.